NEW ITEM, 22 Piece, Professional Makeup Application Set. Want a fresh new face? Use our compelete makeover kit, all you'll need is your favorite makeup, and your lovely face. 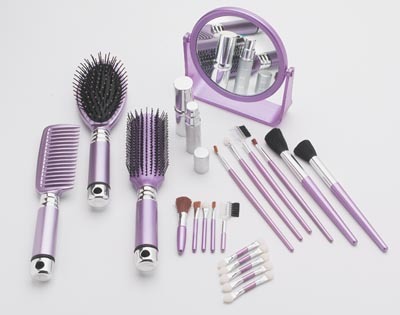 Home > Beauty Aids, Personal Grooming > NEW ITEM, 22 Piece, Professional Makeup Application Set. Want a fresh new face? Use our compelete makeover kit, all you'll need is your favorite makeup, and your lovely face. NEW, 22 Piece Makeup Application Set. -5 small double-ended sponge tip applicators. -Anyone would just love to have one of these handy Beauty Kits! Applying makeup can sometimes be a chore. Especially when you cannot find your favorite makeup applicators right? Well now with our fresh new 22 Piece Beauty Kit, you can have all of your favorite makeup applicator tools in one convenient place. Go ahead and treat yourself to a makeover, you deserve it. Our makeup applicators are designed for comfort when applying your face makeup, and eye makeup. Our handy makeup applicators and hair brushes are also designed to last a long, long time. Here at AAWSALES.com, every one of our items are discounted and always on sale. And to show our appreciation, we also have VALUABLE FREE THANK YOU GIFT PACKAGE offers for our customers!